Just like young children like to hear the same bedtime story, their love of routine can cause them to want to eat the same foods every single day. So, what do you do? It’s okay, the article shares, to give your child what he or she wants, but also offer something else, too. If, for example, your toddler eats French fries every day, offer that plus steamed carrots. One day, your young child may seem endlessly hungry. Then, the next, he or she isn’t even interested in food. Again, that’s usually not reason for concern. Toddlers often like to graze, so offer food in five mini-meals daily, rather than three full ones. Avoid offering sugary drinks and other empty calories – and then don’t panic if he or she refuses to eat. Another Parents.com article tackles this issue, one that can be challenging for a busy parent who is trying to put together a meal. If you’re in this situation, it may take a bit more pre-planning, but perhaps you can find certain foods that all of your children enjoy. In this case, focus on changing what each of those mean. Instead of, say, cookies, offer low-fat pudding, angel food cake or fruit as dessert. Snacks can include fruit smoothies, pretzels or butter-free popcorn. Don’t promise your child a sweet treat if he or she finishes dinner and try to limit cake and candy to once a week. Add finely grated veggies into your child’s macaroni and cheese, rice and so forth. You can add carrots, zucchini and beets to boost nutrition. You can also add grated cheese to veggies to increase calcium intake. Use mild cheeses, such as Colby, Monterey Jack or cheddar. Remember that, when your toddler refuses to eat because he or she isn’t hungry, that’s a good thing. It’s important for your child to learn to eat when hungry and to stop when full. Be a good role model. 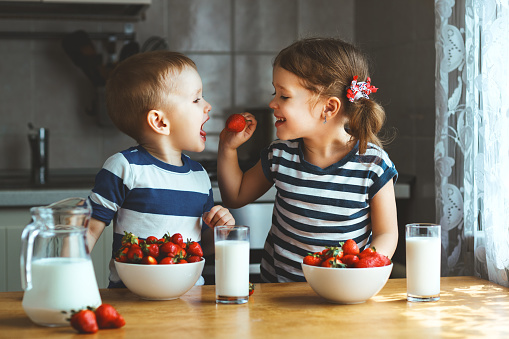 When you eat nutritious foods like lean proteins, whole grains, and fresh fruit and vegetables, your toddler is more likely to follow suit. It’s okay to offer your child oatmeal or whole wheat pancakes and fruit for dinner or turkey and cheese for breakfast. Offer new nutritious foods but don’t get discouraged if your toddler doesn’t immediately jump on the bandwagon. Research suggests it can take between 10-15 times for a toddler to accept a food that’s new to him or her. Turn off the television set and put away smartphones during dinner to enjoy a family meal together. This is a wonderful way to model healthy eating habits, showing that mealtime is more than just eating. It’s also togetherness time.